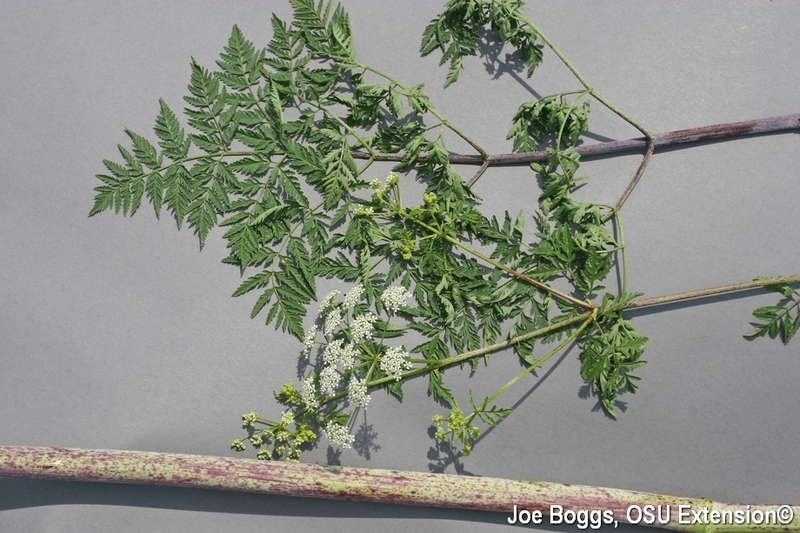 While poison hemlock can be partially managed by mowing and tilling, the most effective control approach involves properly timed applications of selective or non-selective post-emergent herbicides including glyphosate (e.g. Roundup). It is a prolific seed producer, so applications of herbicides made now will control both the first season rosette stage and the second season flowering stage, before seeds are produced. The plant contains highly toxic piperidine alkaloid compounds, including coniine and gamma-coniceine, which cause respiratory failure and death when ingested by mammals. The roots are more toxic than the leaves and stems; however, all parts of the plant including the seeds should be considered dangerous. Unfortunately, this dangerously toxic plant is becoming more common throughout Ohio including growth in landscape plantings where close proximity to people increases poisoning risks.